Have some fun under the sun! Experience an unforgettable vacation in the beautiful Dominican Republic at the 2018 North America Vacation. Enjoy the Caribbean coastline of Punta Cana from the all-inclusive Hard Rock Hotel & Casino and celebrate under the sun with your Herbalife Nutrition family! Book your hotel before time runs out! This year, the 2018 North America Vacation will take place at the Hard Rock Hotel & Casino in Punta Cana, Dominican Republic. You don’t want to miss out on this all-inclusive vacation, so confirm your reservation now! Fun in the sun or rest and relaxation, your 2018 North America Vacation has everything you could want out of a Caribbean getaway.Make lasting memories with your Herbalife Nutrition peers at the scheduled events and activities and enjoy your free time exploring and indulging in laid back resort life. Prepare for sunshine and summertime at your all-inclusive vacation in Punta Cana, Dominican Republic. Find out what qualifications and rules apply.Qualifications to attend are based on achievements of individual Distributorships and Herbalife Nutrition Independent Distributors. Plan ahead for your 2018 North America Vacation! When preparing for your 2018 North America Vacation, check out these useful details including information regarding transportation, fees and credits. Get into the festive spirit at the Dominican Carnival Welcome Reception!Set the rhythm of your vacation at this Dominican Carnival on the beautiful Toro Beach. Let the vibrant colors and crashing Caribbean waves take you over as you mingle with your Herbalife Nutrition peers beneath the stars. Party like a rockstar at the finale night event! Rock and roll never dies, so let the good times roll on the final night of your North America Vacation at the Party Like a Rockstar event at the Woodstock Plaza! The Hard Rock Hotel & Casino Punta Cana is a mind-blowing all-inclusive experience featuring 13 pools, 9 restaurants, a Nicklaus designed golf course and an astonishing spa all lovingly cradled by the most pristine beaches in the Caribbean. Make sure you get the most out of your 2018 North America Vacation! Reference this checklist for packing and preparing for your time in Punta Cana.Before heading to your amazing getaway, make sure you’ve made proper arrangements for your affairs while you’re away and be sure to pack everything you’ll need to enjoy your time in picturesque Punta Cana! 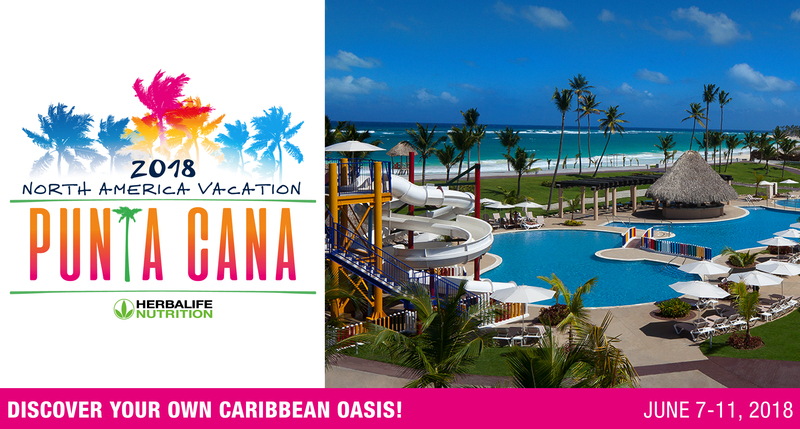 See what’s in store at the 2018 North America Vacation in Punta Cana, Dominican Republic! Get a glimpse of the amenities, daily activities and world-class entertainment offered at the Hard Rock Hotel & Casino on your 2018 North America Vacation in Punta Cana, Dominican Republic! *Herbalife may be filming or photographing these events. By attending these events, you grant Herbalife permission to use your image or likeness in connection with any filming and photography at these events. © Herbalife International of America, Inc. | Herbalife is a proud member of the Direct Selling Association.